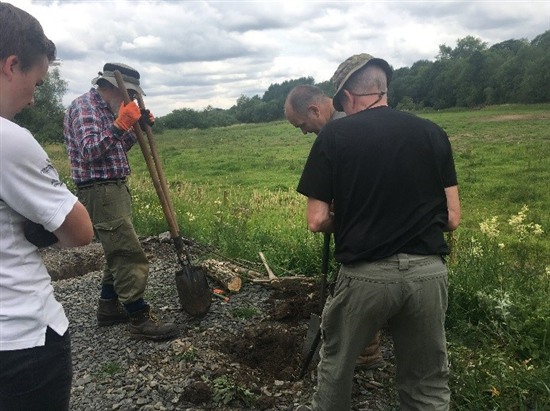 During my first week I was over at Baron’s Haugh meeting the very dedicated group of workparty volunteers, preparing for a new viewing screen, strimming along the paths and pulling Himalyan Balsam. 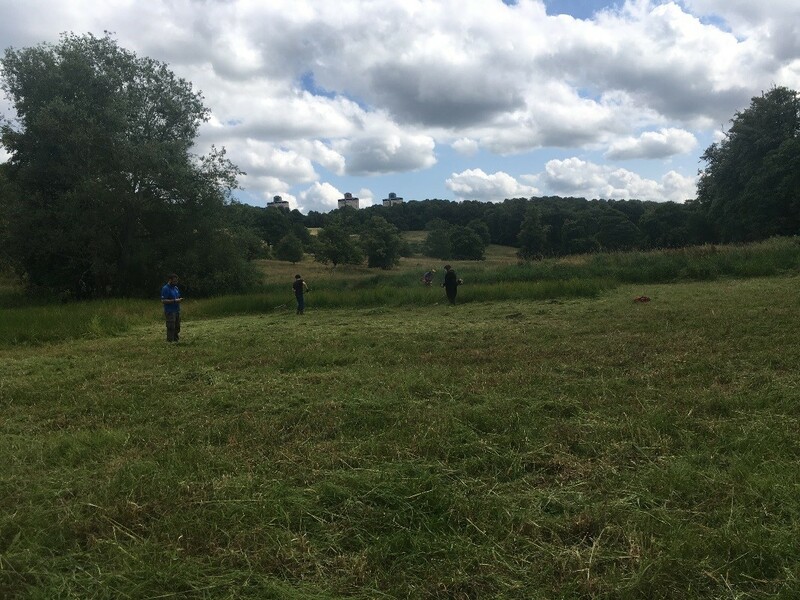 Balsam is an invasive non-native species which spreads rapidly, especially along river banks so we will try and remove as much of it as possible each year. The viewing screen we were digging holes for will be a viewpoint to look out at the newly restored Cemetery Marsh. We are going to be using larch timber from another RSPB reserve to build a simple screen to allow visitors to watch the wildlife on the marsh without disturbing it. I also spent a day last week at Baron’s Haugh doing odd jobs- the kind that often get forgotten day to day. This was a good chance for me to visit parts of the reserve that I hadn’t seen yet and plan some of the work to come in the next few weeks. It was lovely to see some more unexplored parts of the reserve too. Whilst walking along the Clyde at the bottom of the Parkland, we saw a kingfisher fly out of its burrow like a bullet and whizz up river. 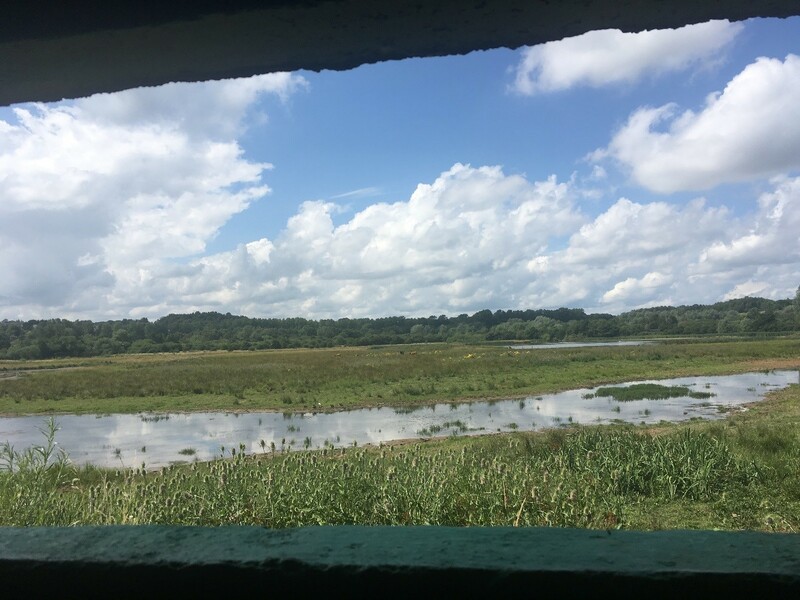 Sitting in the Marsh Hide, having dinner and watching green sandpipers and lapwing feed on the edge of the rills was another highlight! 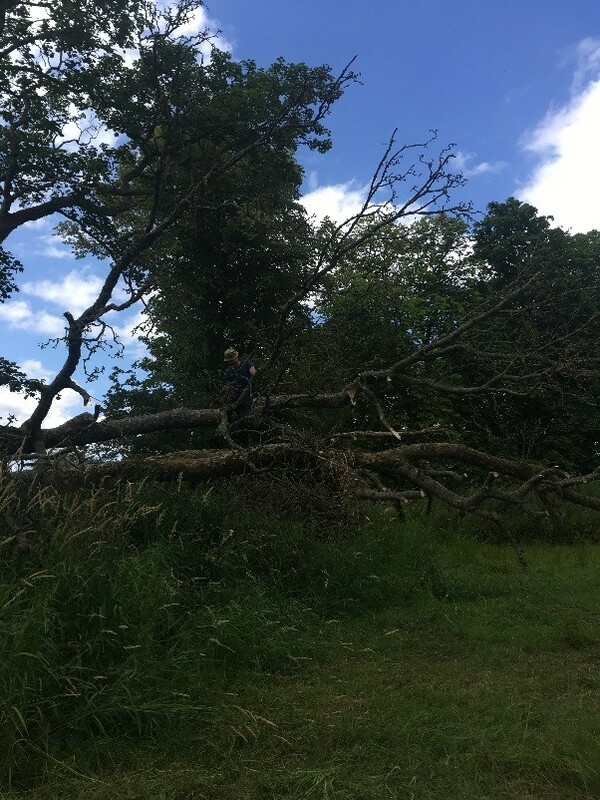 Last week, on another volunteer work party, we were clearing the curling pond of vegetation and tidying up a fallen tree. The curling pond is part of the designed landscape at Baron’s Haugh and we have an obligation of upkeep in that area. The curling pond is a large area to cut with strimmers but our volunteers did us proud- working really hard in the sun and we got much more work done than we’d estimated. If you are on the reserve over the next week, go down and have a look at the curling pond, it’s recognisable now that most of the long grass has been cut and you might even see a kingfisher too! This week, I visited our Airds Moss reserve for the first time, to carry out some surveying of the bog vegetation. This involved traipsing around 8 quadrats, they were quite far apart- my pedometer told me I had walked 7.5 miles at the end of the day- no mean feat over quite challenging terrain. It was a really rewarding day- when you are looking down into the bog vegetation and tuning into it, it’s like its own little world. 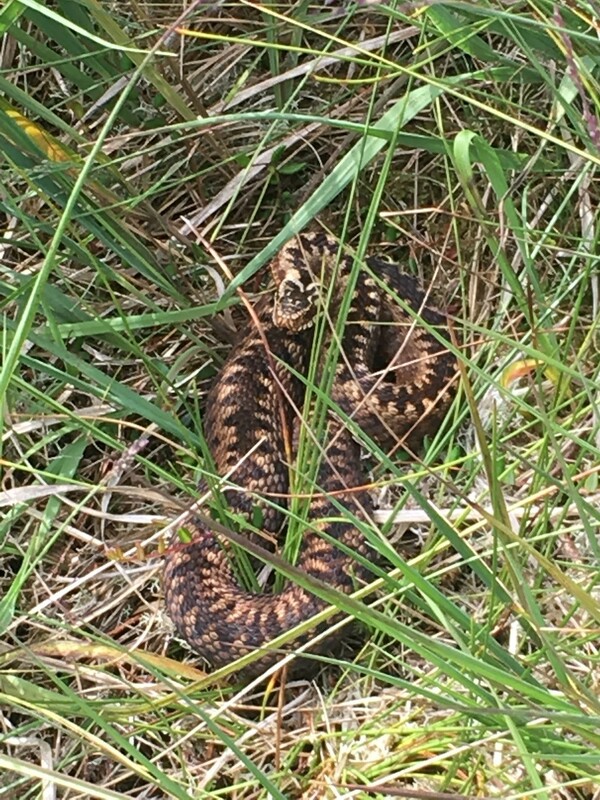 We also saw a male hen harrier, a common lizard and an adder! Not bad for a day in the office! Finally, this week at Baron’s Haugh I ran a children’s event called Pollinator Patrol. 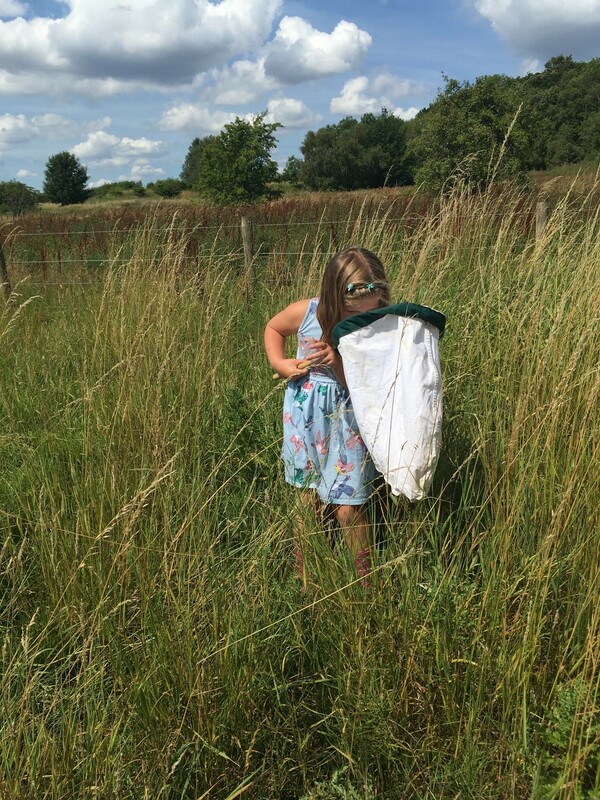 Great fun was had by all (young and old) as we walked through some tall grassland, wildflowers and woodland, looking for creepy crawlies. It was great fun to be out with some really enthusiastic youngsters, hopefully they are the next generation’s entomologists! We saw peacock butterflies, soldier beetles, froghoppers, tiny snails, woodlice and a frog amongst other species. Keep an eye out for future events on our website or get outside and look for yourself!